Craig is an eight-year Marine Corps veteran and a purple heart recipient. He met a dog when in Afghanistan and this is his story of his time there and his life since. Check out his website here. The book is in stores on Tuesday, November 27th from William Morrow. In 2010, Sergeant Craig Grossi was doing intelligence work for Marine RECON—the most elite fighters in the Corps—in a remote part of Afghanistan. While on patrol, he spotted a young dog “with a big goofy head and little legs” who didn’t seem vicious or run in a pack like most strays they’d encountered. After eating a piece of beef jerky Craig offered—against military regulations—the dog began to follow him. “Looks like you made a friend,” another Marine yelled. Grossi heard, “Looks like a ‘Fred. '” The name stuck, and a beautiful, life-changing friendship was forged. Fred not only stole Craig’s heart; he won over the RECON fighters, who helped Craig smuggle the dog into heavily fortified Camp Leatherneck in a duffel bag—risking jail and Fred’s life. 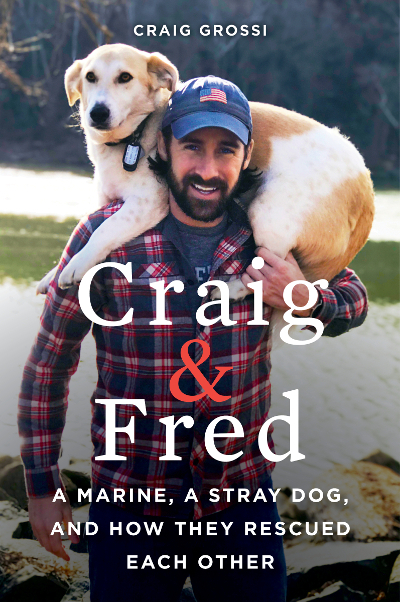 With the help of a crew of DHL workers, a sympathetic vet, and a military dog handler, Fred eventually made it to Craig’s family in Virginia. Months later, when Craig returned to the U.S., it was Fred’s turn to save the wounded Marine from Post-Traumatic Stress. Today, Craig and Fred are touching lives nationwide, from a swampy campground in a Louisiana State Park to the streets of Portland, Oregon, and everywhere in between. A poignant and inspiring tale of hope, resilience, and optimism, with a timeless message at its heart—”it is not what happens to us that matters, but how we respond to it”—Craig & Fred is a shining example of the power of love to transform our hearts and our lives.